Potholes are a common sight on many roads within the UK, especially around springtime. No matter how hard we try to avoid them, there is always that one pothole that catches us off-guard. If you are fortunate enough to leave a hit pothole with all coils and tyres in tacked, then you can drive off with little concern. However, if you have been made a victim by a nasty pothole that has left you with a deflated tyre or broken coils, you can claim compensation. The first action that you should take after hitting a pothole is to collect all the evidence possible from the scene. This includes the exact location of the pothole, photographs showing the pothole and any photos of any damage caused when you hit it. If safe to do so, return to the pothole with a ruler or measuring tape. Place the ruler or measuring tape in the bottom of the hole and take a photograph. By doing this, it illustrates how deep the pothole is. Once you have collected all the evidence you now need to report the pothole to your highways agency or local authority. They are responsible for maintaining the roads in your local area and will need to organise a repair in due course. It is unlikely that you will be compensated before you need your car back on the road. This means that you will need to pay to get any damages fixed before receiving any possible money. Once your car has been fixed, ensure that you get a receipt for all work carried out to repair the damage, this will vital evidence in your case. 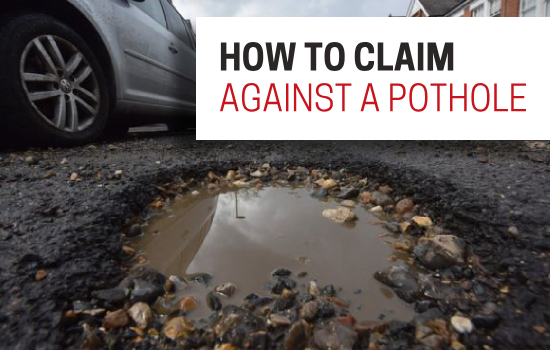 Each local authority has a specific protocol when it comes to claiming against a pothole. Contact your local council to find out what information they require and start the claim proceedings. I’ve Submitted A Claim – What Now? Now that you have submitted your claim, you may be starting to consider what you can do if you aren’t happy with your compensation offer or rejection. My Pothole Claim Was Rejected – What Can I Do? If your pothole claim has been rejected, you may be able to appeal the claim. Put in a request for the council’s road inspection reports. Once you have them you can check to see if they have followed the process as required. If the claim hasn’t followed protocol you can appeal for a review. If you are struggling to reach a resolution with your local authority you can take your pothole claim to a small claims court. Seek legal advice before going down this route. If your legal team are in support of your claim and believe they can help you get the compensation you can further pursue your claim for your pothole damages.